With the half-time performances of the collegiate cheering squads in every basketball game becoming lackluster, the UAAP board began exploring new forms of entertainment to keep the crowd going. 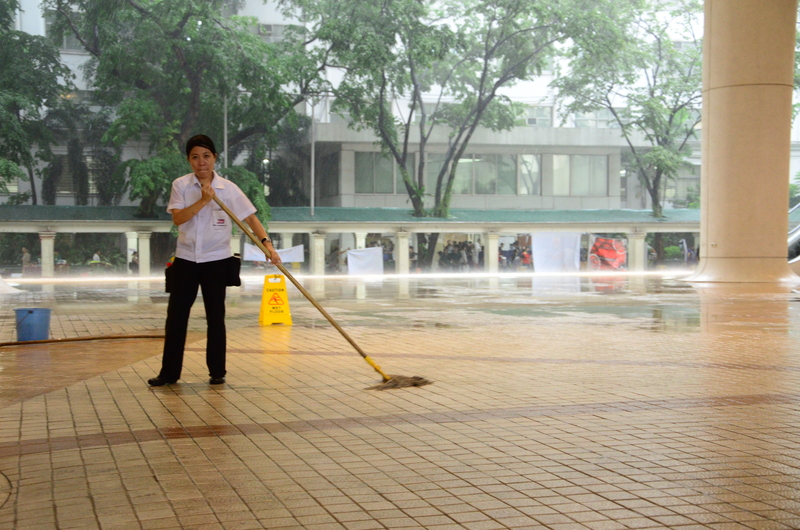 After a series of deliberations, the board is currently considering capitalizing on the unintentionally entertaining synchronized mopping during Game 3 of the previous season’s finals matchup between the DLSU Green Archers and the UST Growling Tigers. With the recent talks rising around the league, Segismundo and the rest of the crew agreed with the idea of supporting the tournament not only by mopping the court every now and then but also entertaining the crowds through their amusing cleaning performances. If approved, it would be an entirely different experience for them as they would be a part of the gaming events that the crowd anticipates. According to UAAP officials, half-time shows are really crucial because it is the time used to maintain the energetic atmosphere of the venue as the athletes rest and prepare for the second half. In response to the diminishing satisfaction of the viewers during these time periods, a new kind of entertainment in the form of synchronized mopping might be the solution to the current half-time dilemma. According to the board, if ever this proposal is approved, they are inviting the janitors of the different universities to participate. Margarito Morales, a janitor from De La Salle University, genuinely showed interest to be part of the performance saying that it would be a new and exciting opportunity to show his talents and skills. There have also been plans to make it a competitive sport with the same mechanics as that of the annual cheerdance competition, however further discussions would follow after the proposal is approved. In a general survey from the UAAP cheering squads, they do not mind sharing the spotlight as long as they will still be given sufficient time to perform during the games. Currently, the synchronized mopping proposal is undergoing final revisions and should be implemented in the upcoming UAAP season.